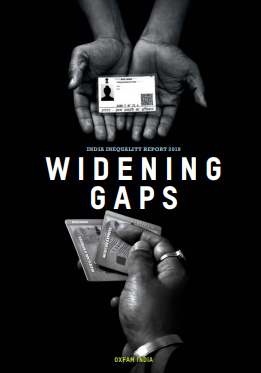 Oxfam India’s recent “India Inequality Report 2018: Widening Gaps”, among other things, points towards how lurking gaps exist not just between the rich and the poor, but also between organized sector workers and unorganized sector workers. Authored by Himanshu, Associate Professor at the Centre for Economic Studies and Planning, School of Social Sciences, Jawaharlal Nehru University, New Delhi, the report states that the situation is particularly pathetic, as 93% workers come from the informal sector. The labour market in India shows gross inequalities in terms of quality of employment. While a large majority of workers are employed in the informal sector with no social security, the organised sector has also seen a decline in employment quality over the years. At the national level, 93% of all workers are employed as informal workers. While a majority of these are employed in the unorganised sector where almost all the workers are informal workers, but they are also in the organised sector where the percentage of informal workers employed has increased in recent years. In 1999-2000, 38% workers were employed as informal workers in the organised sector; this increased to 56% in 2011-12. Further disaggregation of the public and private sector suggests that it is the private organised sector which contributes to a significant chunk of informal workers; the share of informal workers in the organised private sector is almost two-thirds. While the quality of employment has declined in the last two decades, the decline in the number of jobs created has also contributed to rising inequality. Against almost 10 million, in the working age-group, entering the labour force, the annual job creation in the economy in recent decades has been for 2 million workers. Between 1993-94 and 2004-05, the annual addition to the workforce was 7.6 million per year, which fell to 2 million workers per year between 2004-05 and 2011-12. While recent estimates are not available, Abraham (2017) reports a net decline in the number of jobs after 2014. The inequality in labour market also arises from the skewed distribution of workers across sectors. Despite its falling share in the GDP, around half of the workforce in India is still employed in the agricultural sector. While the growth of the agricultural sector has remained less than 2% on average since 1991, the employment in agriculture increased during the same period. On the one hand, a large share of workers is employed in the unorganised sector, even though its share in the GDP has been falling. On the other, the sectors which have grown the fastest, such as finance, insurance, real estate sector and IT-related services and telecommunications, employ less than 2% of the workforce. This has led to increasing divergence in per worker productivity between workers in sectors with the lowest productivity i.e. agriculture and construction and the workers in the fast-growing sectors. The ratio of labour productivity in the nonagricultural sector to labour productivity in the agricultural sector has increased from 4.46 in 1993-94 to 5.52 in 2011-12. Estimates of wage inequality have been presented in an earlier section and these confirm the growing divergence between workers in different sectors. The labour market outcomes are primarily a result of the fact that gains from growth have been unevenly distributed. This is because of the nature of the growth process itself. The liberalisation process, which was set in motion in 1991, attracted massive capital inflows. This set off a domestic retail credit boom, and along with fiscal concessions it created an environment for a hike in consumption of the better-off households and ‘competitive consumerism’. While this fuelled a rapid growth of GDP, there remained an abysmally low public spending on basic facilities, insufficient employment generation and a persistent agrarian crisis. However, as the wage shares have fallen during the period of growth, consumption demand of the masses has stayed low. The persistence of low productivity employment in all the major sectors even after many years of rapid economic growth in India is a particularly unusual growth pattern. Thus, the pattern of capital accumulation in both the earlier dirigiste period and the current neo-liberal period has not generated the required structural changes in the economy. The Indian system of capital accumulation is one of “exclusion through incorporation”, particularly in the neo-liberal period. The growth strategy has not included measures which would enable mass consumption of goods. In the absence of sufficient measures, the inequalities in the system have persisted and even intensified. The capital accumulation process has exploited the differences on the basis of caste, community or gender in the labour market, which has further exacerbated these differences. The financial institutions, input and product markets, and insufficient access to credit also intensify this problem. The social institutions and political forces allow the discriminatory labour practices to continue, and the legal and regulatory institutions enhance the bargaining power of capital. The governments have aided the existing capital accumulation process, by allowing heavy corporate tax exemptions, appropriation of land and natural resources, and by the lax implementation of regulations. Some confirmation of this trend is available from the national accounts which give the factor incomes by occupational categories. The highest increase has been in the share of private surplus (profits), which has more than doubled from 7% in 1993-94 to 15% in 2011-12. On the other hand, the share of income accruing to cultivators has come down from 25% to 14.6% over the same period. While this mirrors a decline in the share of agriculture in GDP, along with increasing share of nonfarm incomes as seen in the case of nonfarm wages and non-farm self-employed, the growth of non-farm incomes as a whole is far lower than the corresponding increase in its share as seen through the national accounts. The changes in employment structure have been far slower than the corresponding changes in sectoral shares in the national accounts. An important aspect of the changing work-force structure has been the declining share of agricultural labourers and cultivators with a corresponding increase in non-farm wage workers and non-farm self-employed. On the other hand, share of private salaried workers has remained unchanged with a marginal decline in the share of government salaried workers. The highest growth in per worker incomes is observed in the private salaried workers and government salaried workers. In fact, since 1999-00, the growth of per worker incomes of private salaried workers and government salaried workers has been almost double that of other workers. There has been some increase and catch up as far as workers in agriculture are concerned after 2004-05 but over a longer period, their incomes have increased by less than half of those of private and government salaried workers. Supporting evidence in this regard is also available from another source of data. The Annual Survey of Industries (ASI) brings out the emoluments received by various categories of workers. 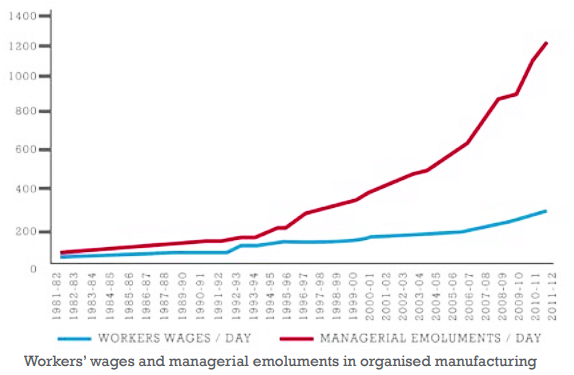 While worker’s wages and emoluments of managerial staff were moving in tandem until the 1980s, they start diverging from the early 1990s and have continued to diverge further. By 2012, the last year for which data is available, managerial emoluments increased by more than 10 times but workers’ wages have increased by less than 4 times. The ASI data also shed light on the declining gains to workers even though productivity has increased in manufacturing. This has been achieved by suppressing workers’ share in net value added at the cost of profits. 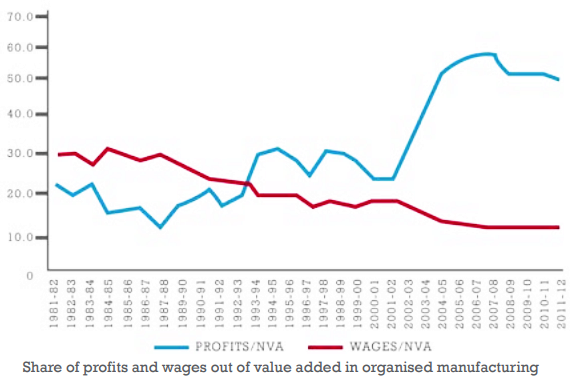 While wage share was higher at around 30% in the early 1980s with profit share at only 20%, the shares changed after 1990s. In recent years, the share of profits in net value added has increased to more than 50% reaching a peak of more than 60% in 2007-08. While it has declined after the financial crisis, it continues to be above 50% of net value added in organised manufacturing. During the same period, the share of wages in value added declined to 10% and has remained thereabout in recent years. The compression in wage share was accompanied by contractualisation and casualization of workforce in organised manufacturing. The share of contract workers to all workers being employed, was less than 20% in the beginning of this century. But within a decade it increased to more than one-third. The contract workers not only suffer from the insecurity of tenure but are also paid less with no social security benefits.